Moving and making. Making and moving. It’s like the ultimate kid combo of creativity. We love getting creative here as a chance to connect and calm the farm. But, sometimes, our making and creating is big. Loud. And action-packed. Here are 9 of our favourite action art ideas for kids. Possibly one of our favourite action art activities of all time. Wrap bubble wrap around your little artist’s feet and secure with duct tape. You’ll need a large sheet of paper. 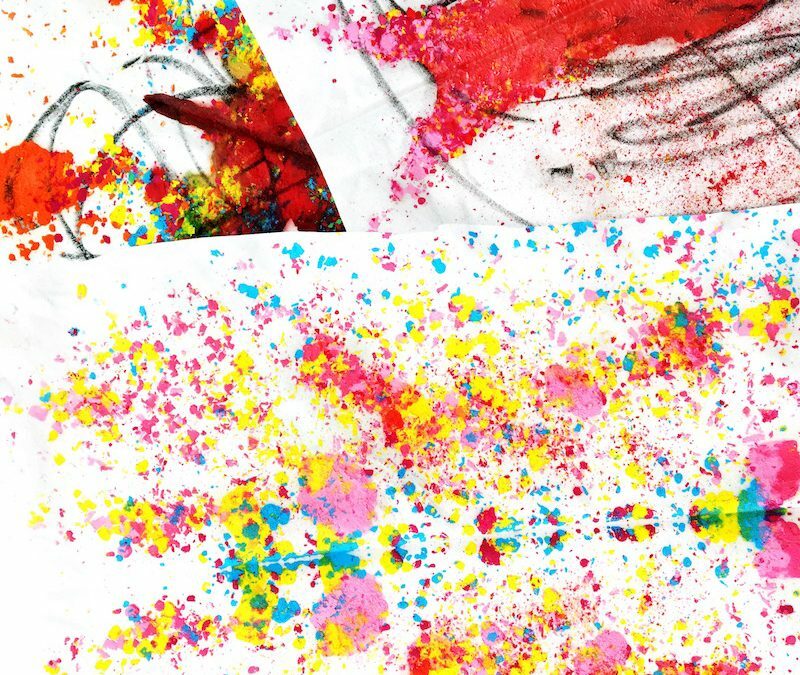 Squirt paint on the paper and let your Mini Maker skate across the paper. WARNING: this can get slippery. We had a bench running alongside the paper so that Miss 4 could hang on as she needed. Oh and you probably want to do this one outside, near a hose. The very cool people at Oskar’s Wooden Ark gave us a Wobbel board. Basically changing our lives forevermore. But what do you do with a Wobbel board? You hand it over to your child and you watch the magic unfold. In this activity we taped a big sheet of paper to the wall. We placed the Wobbel board in front of the paper, and placed some crayons on a nearby stool. And then we waited to see what would happen. Miss 5 took to the invitation with gusto. Action Art can seem a bit daunting for the uninitiated. If you’d like to dip your toes into the Action Art pond, start small. This project is a perfect start. Place some paper in a box. Squirt some drops of paint onto the paper. Let your little artist/ rev head “drive” their cars through the paint. The mess is relatively contained with this one. If the toy car painting is nice and contained, then this one is NOT. It’s fast and furious and oh so fun. Pierce holes into several plastic cups. String these up somewhere, somehow. We used our clothes horse. Line a box with paper and place it under your plastic cups. Fast-flowing acrylics are the best paint choice here. You can use liquid watercolours or water down some acrylics. Just be aware that it is possible to go through A LOT of paint QUICKLY with this activity. Once everything is in place, pour paint into the cups and swing them back and forth. I loved this activity because it was fun to watch the kids move between a horizontal and vertical workspace. We taped a drop sheet to the fence. Then we taped paper in place and squirted paint onto a tray. We then provided our little artist with different kitchen utensils and watched the masterpiece unfold. This one came to me in the middle of a hot Australian summer. We were at the supermarket when my children spotted some fly swatters. “We can make art with those!” was my initial thought. We taped a long sheet of paper to the fence. I drew little flies on the paper in black crayon. This one was hilatious fun. Have you ever seen a Holi celebration? Where coloured powder is thrown around in the ultimate celebration of colour. We made our own coloured powder. In a tray, combine cornflour, water and food colouring of your choice. Leave the tray out in the sun for a few days. 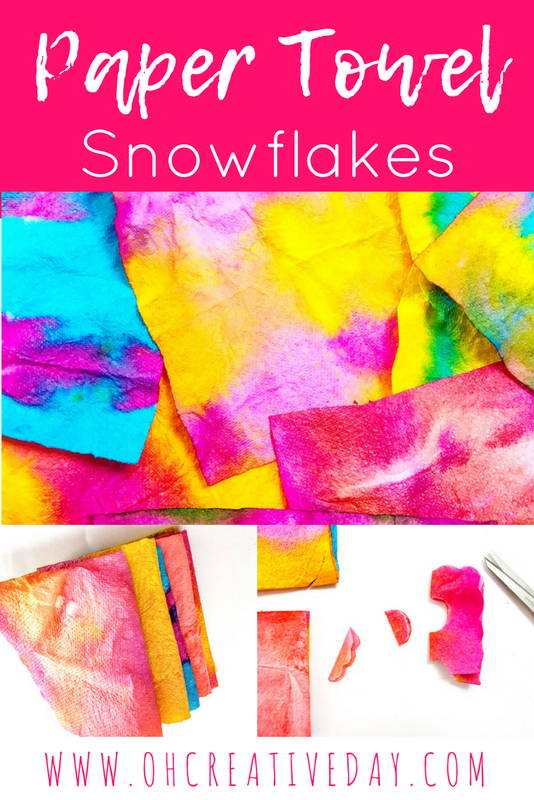 The water will evaporate and you will be left with sheets of coloured cornflour. You then grind this down into a powder. We left tubs of the powder around the yard and went wild throwing it into the air. Still a win in our books. 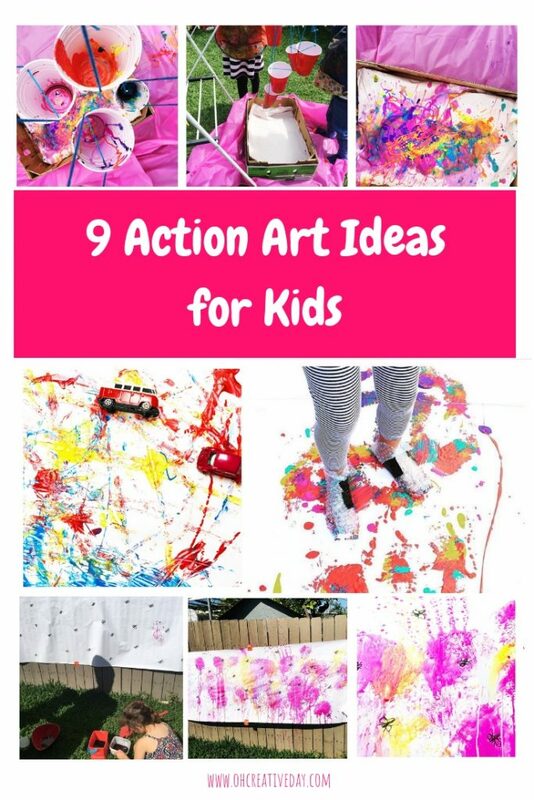 Our friends Cara and Kinley over at Raising Kinley are also MAJOR action art fans. I adore the way they teamed music and movement to create this masterpiece. This shower curtain art is probably the most epic action art project I’ve ever seen. It’s on our Summer To-Do list! Head over to Tinkerlab where Cara shares her full recipe for this magical paint. If you try any of our action art ideas for kids, be sure to tag us on social media. 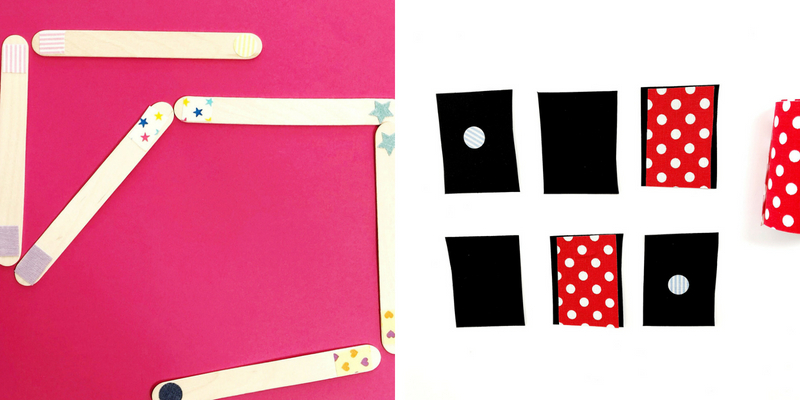 Do you have a little one super keen to tackle sewing? Are you looking for some project inspiration? 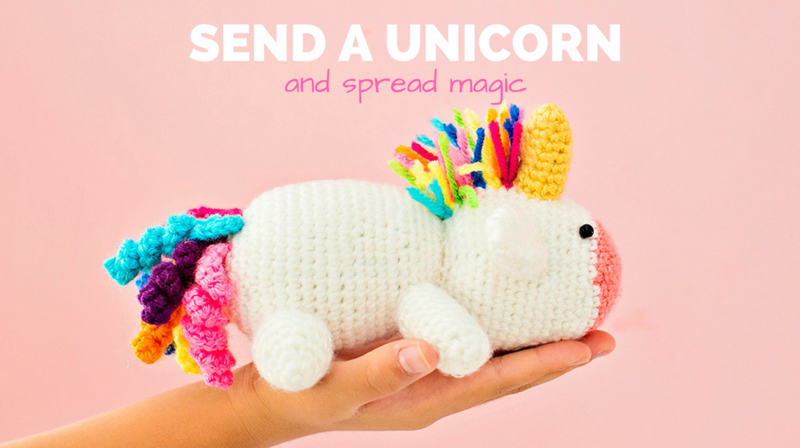 Throughout July, a worldwide posse of bloggers have been creating simple sewing projects for kids for Sew a Softie. What is Sew a Softie? It is the brainchild of Trixi from Coloured Buttons. Trixi is committed to sharing hand-sewing with a new generation. She encourages parents to overcome the trauma of their high school sewing classes (was that just me?!) 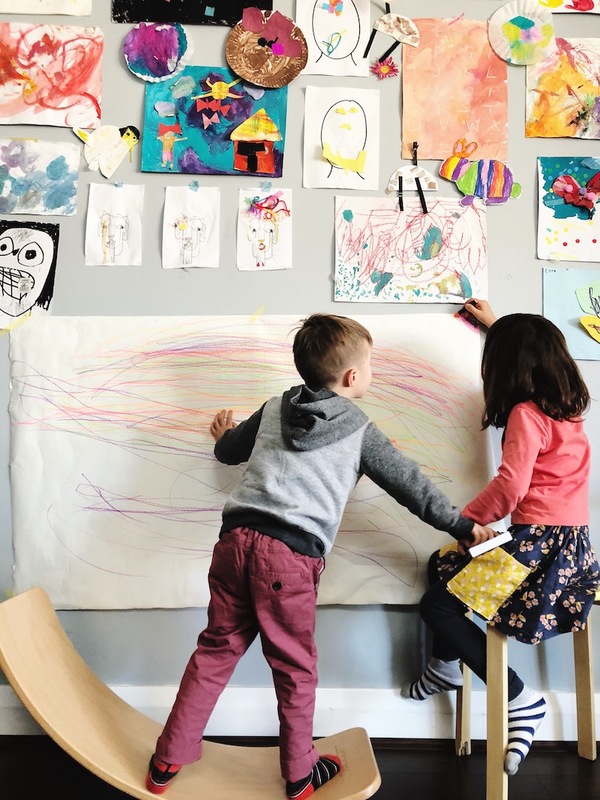 and to connect with their children via this creative, useful and simple skill. 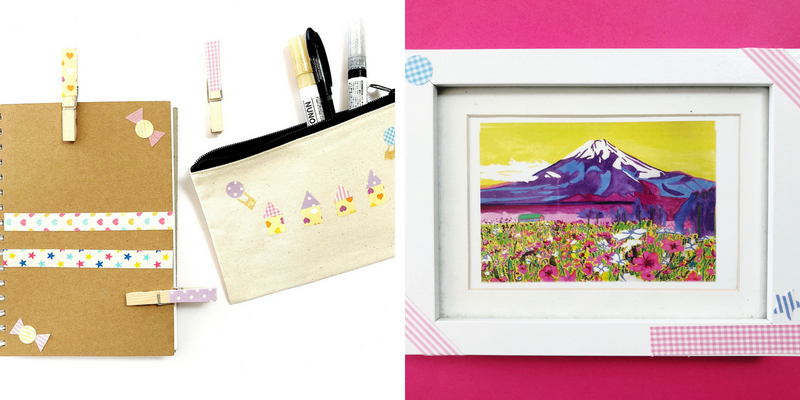 You can find out more about Trixi in my Oh Creative Lady interview. Or you can grab her eBook from my store! During July, bloggers create and share tutorials for stuffed toys, simple enough for little hands to sew. Thanks to the confidence that Trixi has given me, I’ve been able to introduce my almost 5-year-old to sewing. Miss almost-5 adores it. She is however quite the perfectionist. Lately she has been getting frustrated at her softies not turning out as she envisioned. 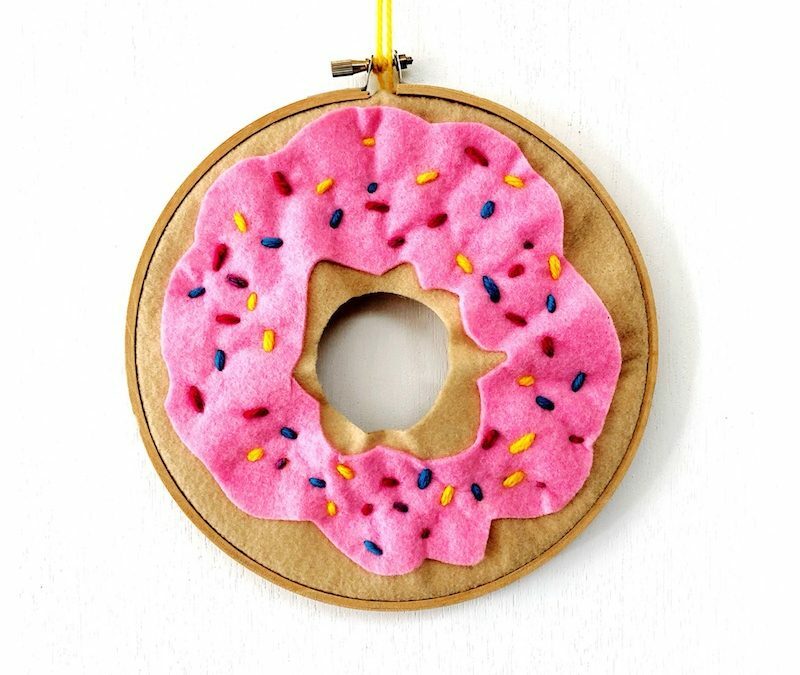 So this simple donut sewing project was devised to try and alleviate some of this frustration. It’s an easy way to build up hand strength and practise sewing. Because you can’t get sprinkles on a donut “wrong,” can you?! 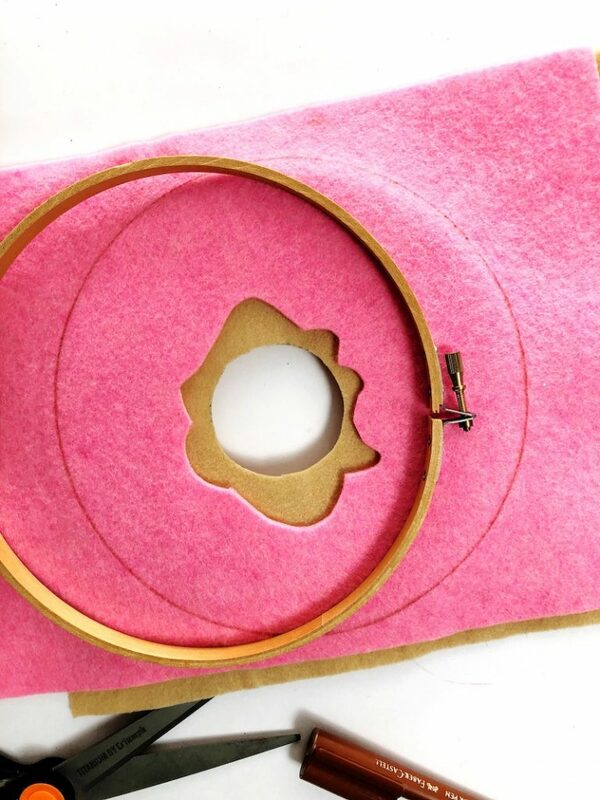 Position your brown felt in your embroidery hoops. Determine the centre and cut out your donut hole. Secure felt between hoops. Trim away overhanging excess. Thread yarn through needle and secure icing in place with a few stitches. 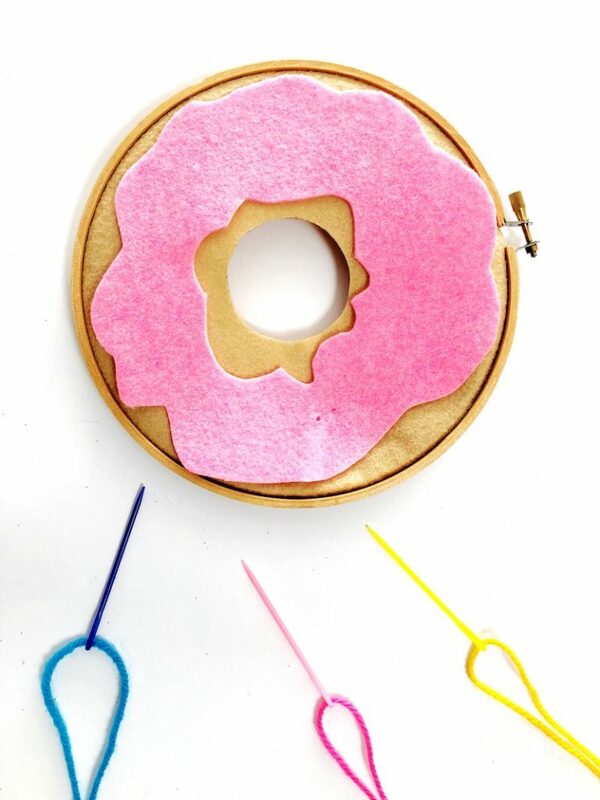 Present needles threaded with different yarn to your child and let them explore stitching “sprinkles” onto the donut. TIP: I initially presented plastic childrens’ needles. It quickly became apparent that these were not strong enough to push through the two layers of felt. In the end we used a standard needle. You will need one with a large enough eye to thread the yarn through. The beauty of sewing the “sprinkles” is that there is no right or wrong way for it to look. Add as many or as few as desired. 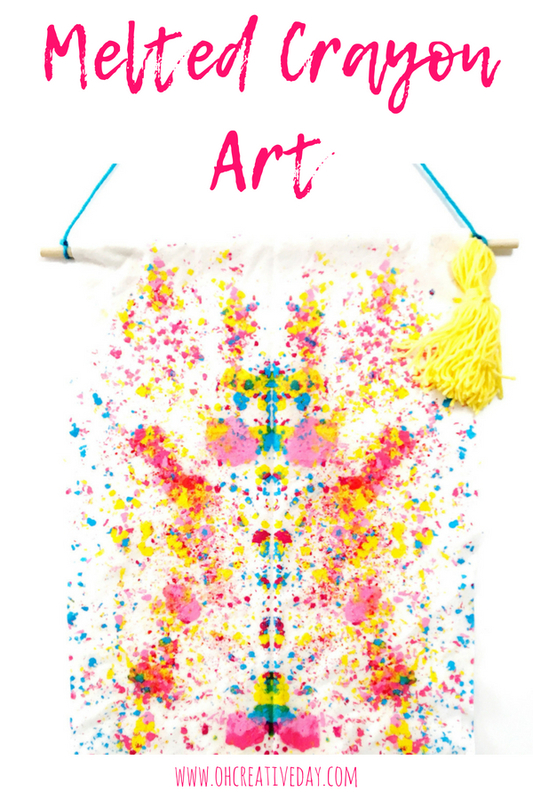 Admittedly the back of this wall hanging looks messy. But hey, the back is going to hang against the wall, hidden from the world, anyway. Even Mr 3 couldn’t resist getting in on the action. 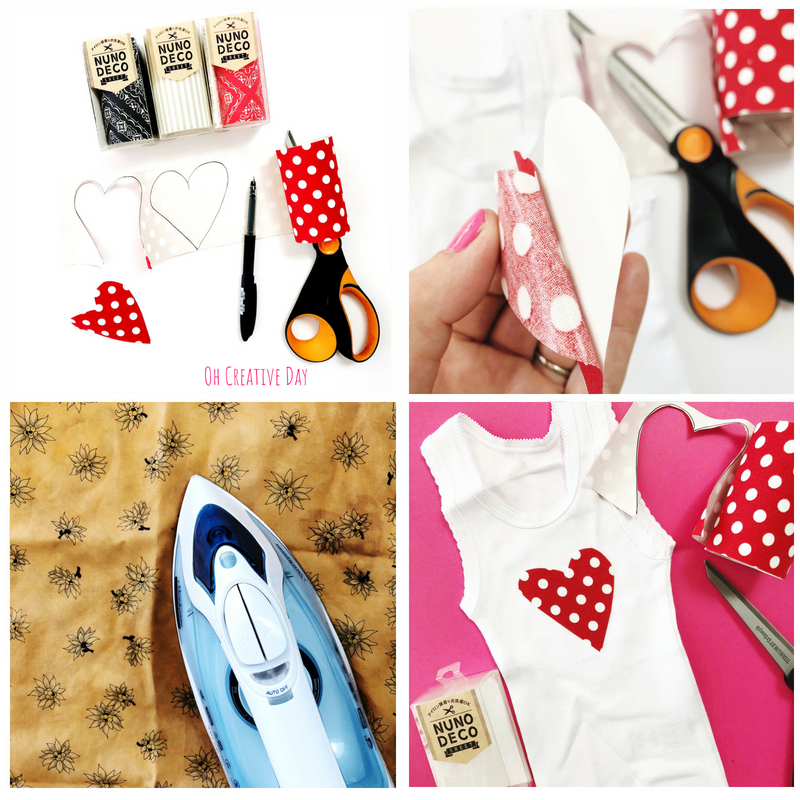 Click to check out all the other tutorials shared during Sew a Softie 2018. This post is sponsored by Hands On Workshop. Japan holds a very special place in my heart. Mainly because it’s the home of washi tape. Oh and it’s also where my husband proposed. When the team at Hands On Workshop asked if I’d like to check out their exclusive range of Nuno Deco washi tapes, it was a no-brainer. 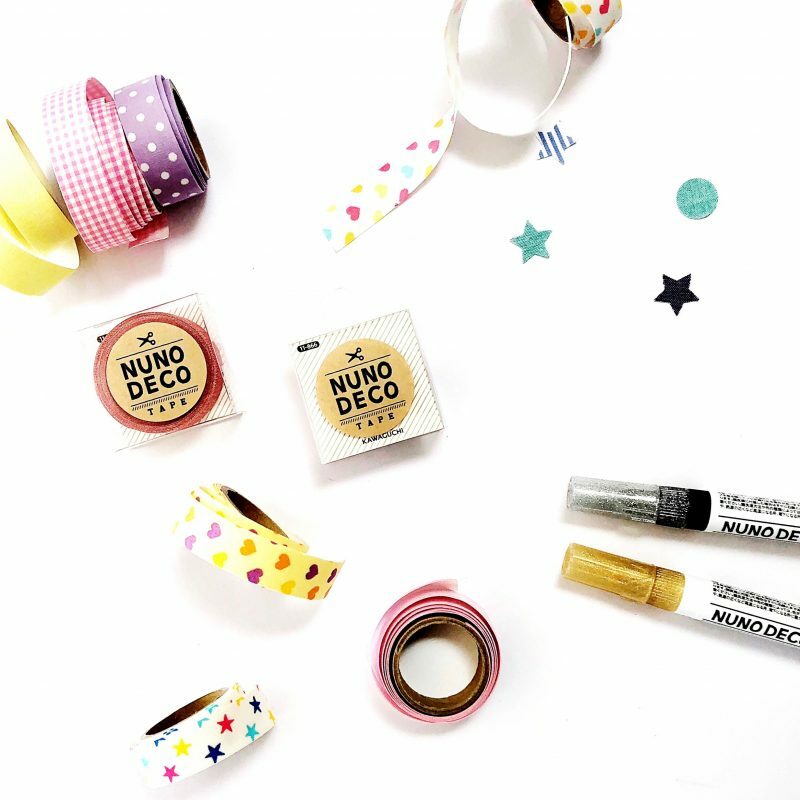 What makes Nuno Deco washi tape unique? It is a fabric washi tape with a peel-off backing. 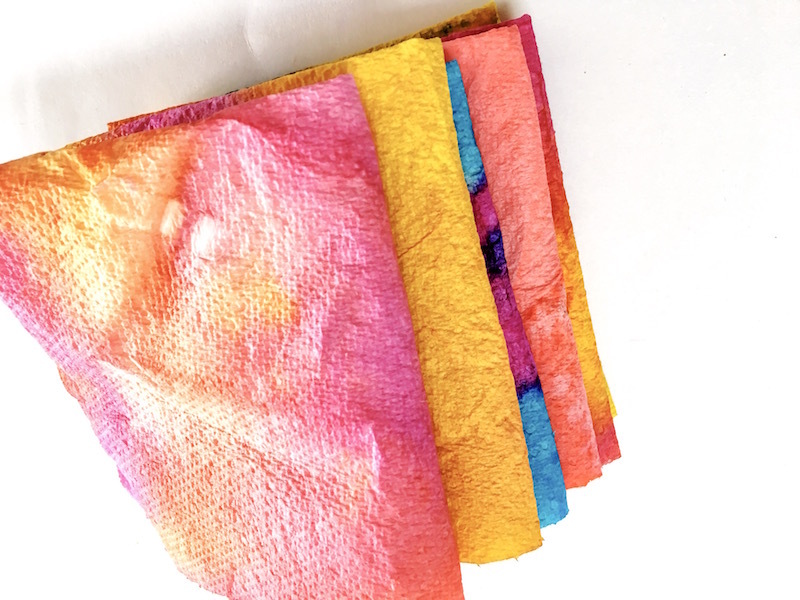 You can apply it to fabrics, iron it in place and it can be put through the wash.
Nuno Deco can also be used on non-fabrics like notebooks, photo frames… you’re only limited by your own imagination. Use it to personalise all. the. things! 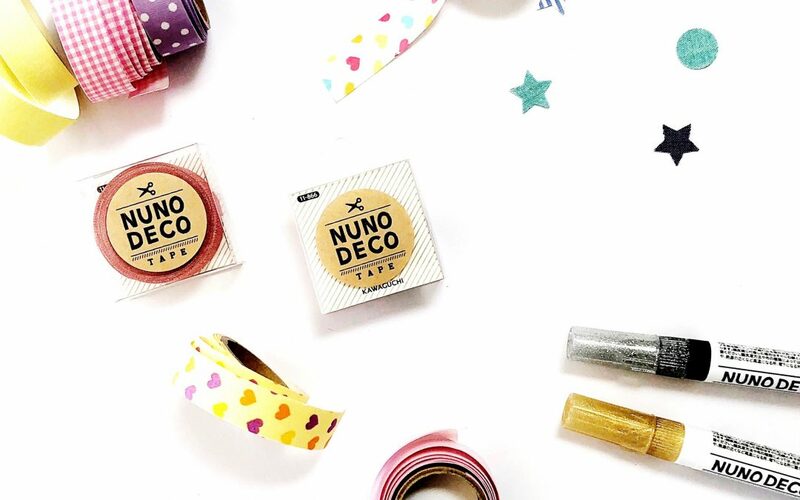 Nuno Deco tapes come in standard tape sizes, but they are also available in these awesome Sheets of tape. I adored playing with the Sheets of tape as you could create your own larger shapes. Simply draw the shape onto the peel-off backing and cut it out. Application is super simple. Peel the backing off and position it where you’d like it. Once pleased with positioning, you place a thin piece of fabric over your design and iron for 20-25 seconds. Done! Your tape is now held in place and is laundry-safe! The Sheets are also perfect for simple embellishments. 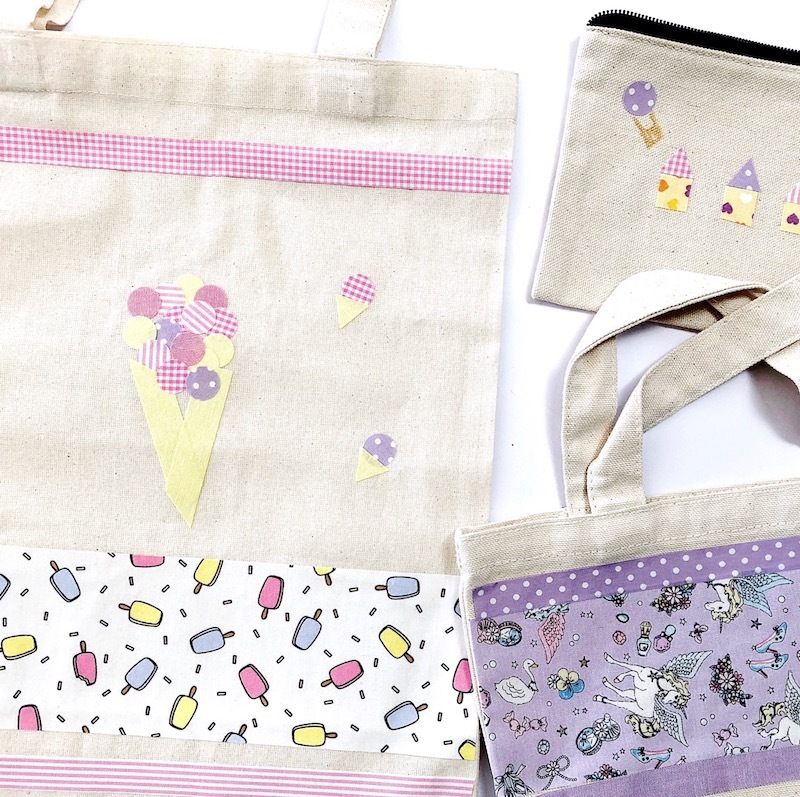 Such a simple way to customise tote bags! I think the popsicle Sheets are my fave! If freestyle cutting shapes isn’t your thing, then the packets of Flake Fabric Shapes are for you. Pre-cut stars, triangles and circles make decorating so easy. As my eldest starts school next year, I’ll also be saving some of the tape to label all the school jumpers, hats and other school paraphenalia! 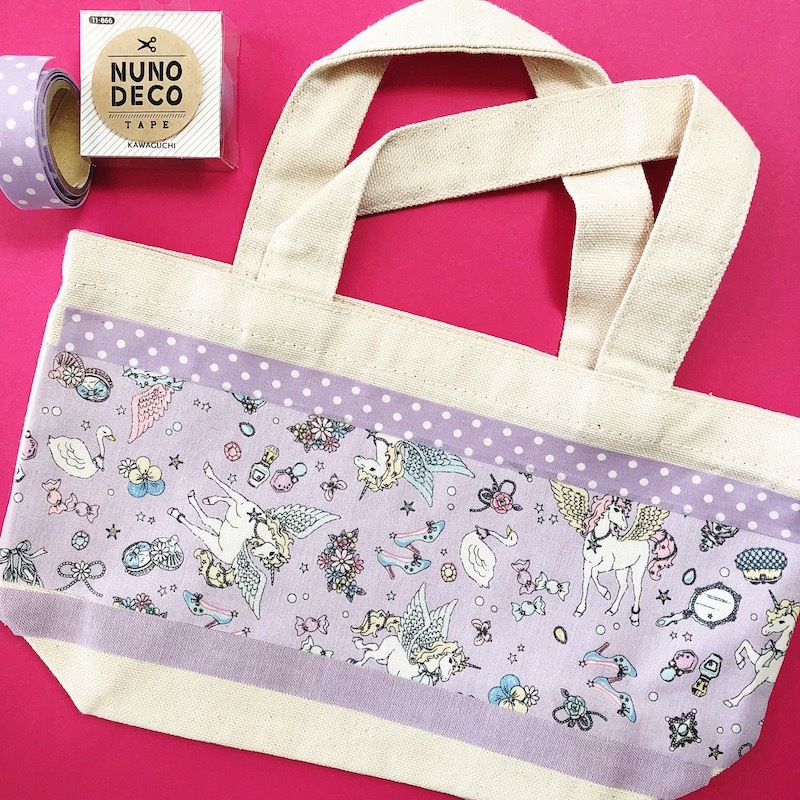 Nuno Deco tape doesn’t have to be used solely on fabric. 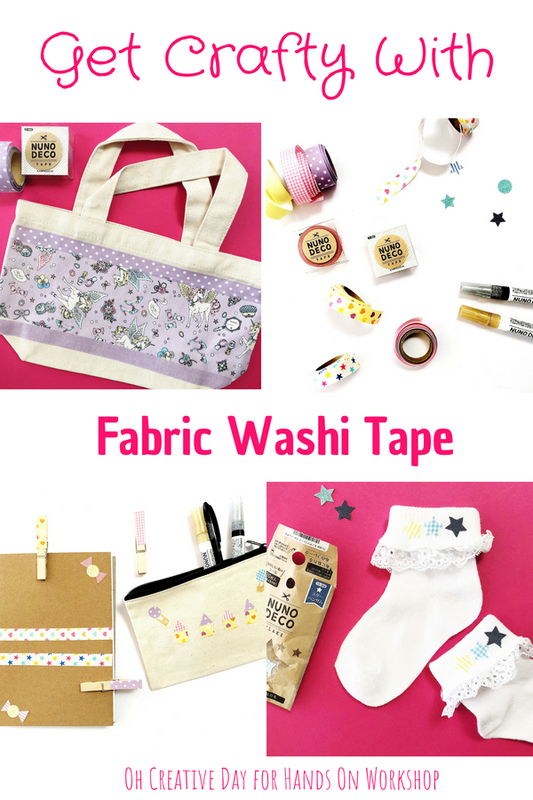 It can be used like traditional washi tape without any ironing involved. Use it to create your own notebooks and photo frames. I used it to decorate wooden pegs to act as paper clips. Label cords with it! So many possibilities. They brandish the stuff any chance they can get. We used Nuno Deco tape to create dominoes using craft sticks. Using some cardboard rectangles, we also made our own game of Memory. The kids and I keep coming up with loads of creative possibilities for this amazing washi tape. The personalised possibilities really are endless. The iron is, by far, the most neglected appliance in our household. My mum was recently over and asked where the iron was kept. It was eventually located (second top shelf in the pantry) and such knowledge came in handy for this melted crayon art project. To be truly honest, the likelihood of the iron being used in more future craft projects than actual clothes ironing is high. One of my life philosophies is to invest in clothes that do not require ironing. 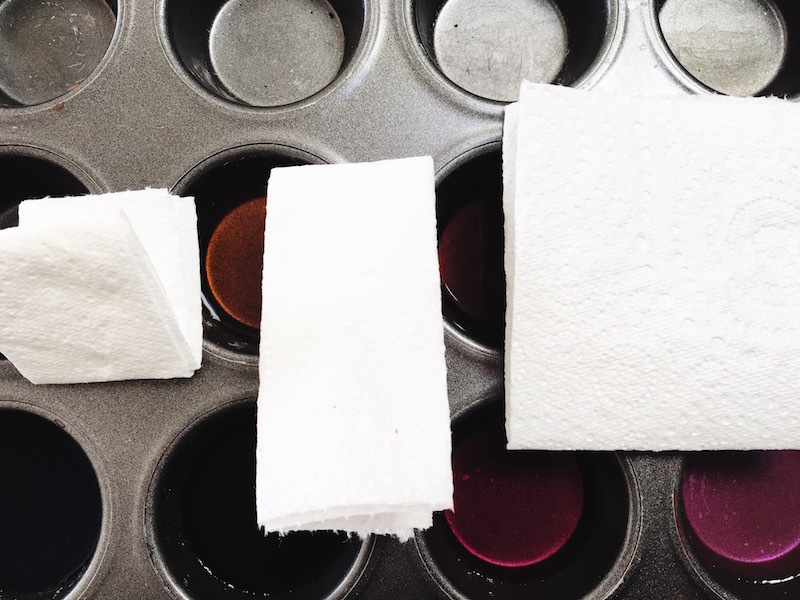 Pieces of cotton – we tore up an old sheet. An excellent excuse to spring clean the linen cupboard. SAFETY NOTE: This activity involves using an iron. Those things be hot. Adult supervision is necessary. With my kids (aged 4 and 3) I took charge at this stage. Older kids could complete this step, but please take all necessary safety precautions, people. I ironed on top of our wooden chopping board. Make sure you iron atop a suitable surface. Using a knife, scrape crayon and capture shavings in a tray. Depending on the age of the children, this step may be best completed by an adult. Older children could perhaps complete this step with a plastic knife. Exercise your own judgement. Fold your piece of fabric in half. 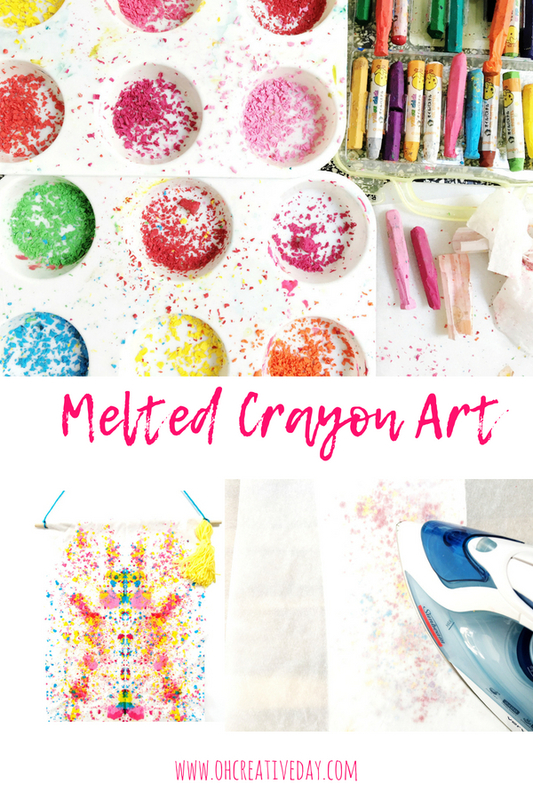 Sprinkle crayon shavings onto one half of the fabric. 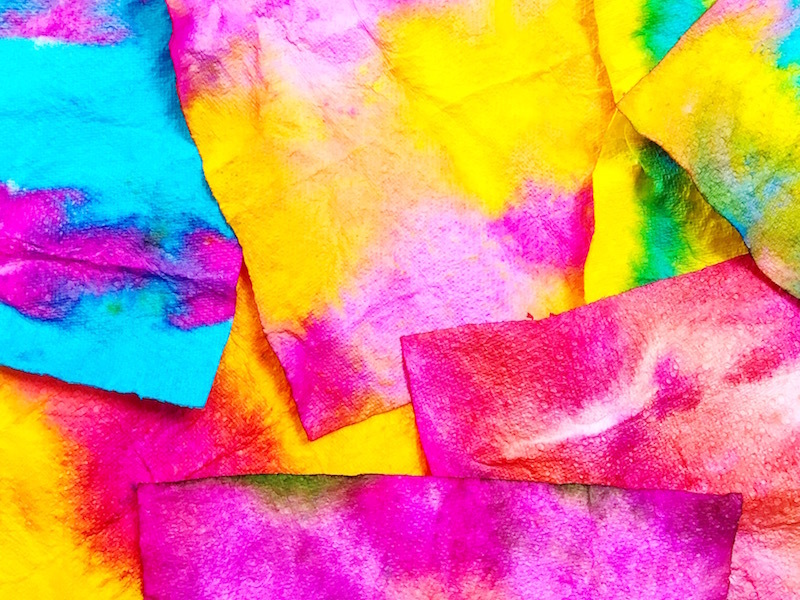 Depending on the effect you’re after, you might like to experiment with scraping crayons straight onto the fabric. Fold your fabric in half. Lay between two sheets of baking paper. Iron over the top. You will feel the crayons melting underneath the heat. Once you get the sense that all the shavings have melted, remove baking paper and unfold fabric. I sewed a small hem and then threaded a piece of dowel through. I added yarn and turned our melted crayon masterpieces into wall hangings. 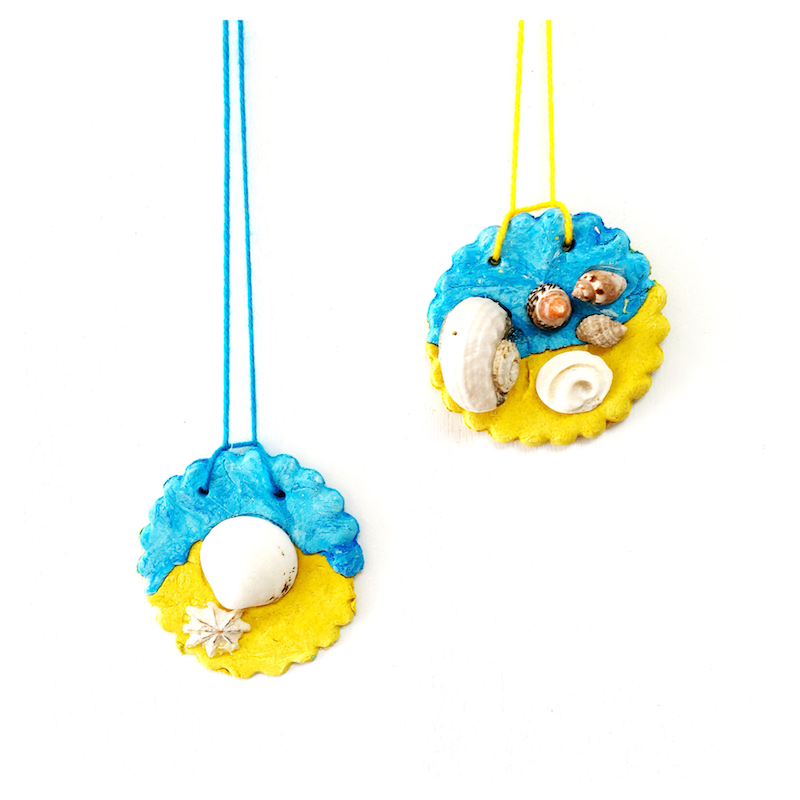 This Summer craft was created to capture those feelings of long Summer days. Here in Sydney, we’ve had what felt like an Endless Summer. We were swimming in the ocean well into Autumn. The weather was so exceptional that we took a quick beachside getaway to soak up the last sunshiney rays. Lying down and soaking it all in. And it involved a lot of collecting shells. 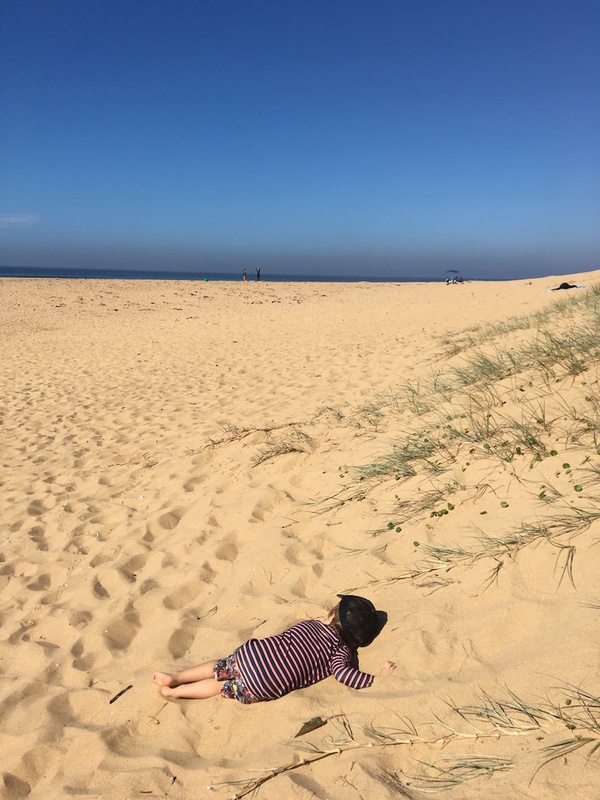 So when we returned home, after emptying the sand out of all the bags, pockets and socks, we decided to make a souvenir of our summery Autumn getaway. 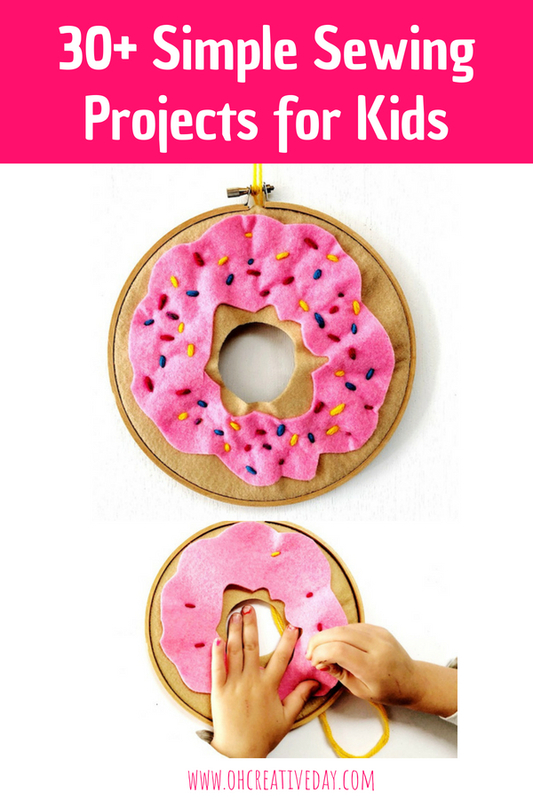 This Summer craft is perfect for little hands. We mixed some white clay with blue and yellow clay to create our own colours. This step took the longest as the kids enjoyed working and rolling the clay between their hands. Eventually, we rolled our clay out into two strips. Then we placed one strip over the other and gently massaged them together to create one strip. Using a cookie cutter, we created our circular disks. Using a skewer, we poked two holes into the top of our ornament. We then arranged the shells on top of the clay, into a composition that we liked. We gently pressed the shells into the clay to create an imprint, before removing the shells and setting them aside for later. Following the instructions on the packet, we placed the clay in the oven and baked it. Once it was baked and cooled, we strung yarn through the tops of the discs. Then, using a hot glue gun, I glued the shells in place. 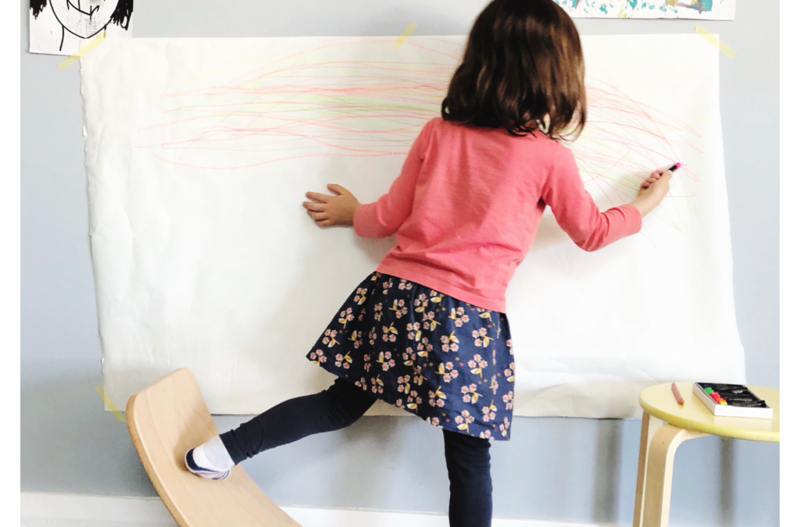 Older kids could complete this step with a low-heat glue gun. 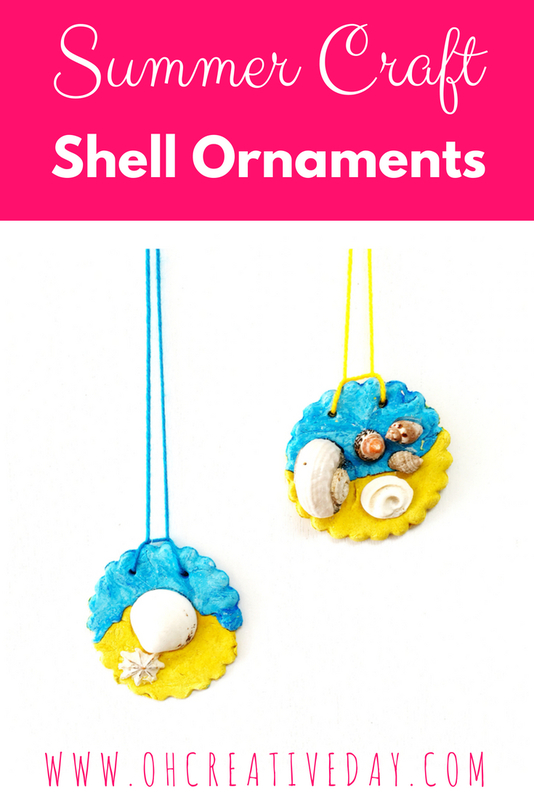 Once the glue had dried, we hung our shell ornaments in our hallway. Every time I walk past them, I will Summer to return STAT. 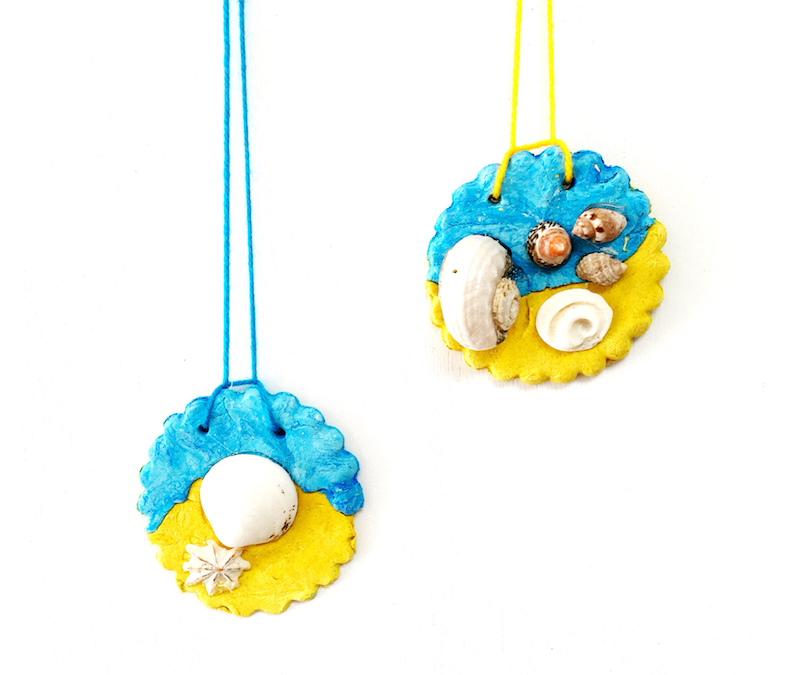 Need another Summer craft project? How about you throw another prawn on the barbie?